Hallowe'en, by Robert Burns was published in 1796, in the Kilmarnock edition. “Will ye go wi' me, grannie? This entry was posted in Main Page, Robert Burns & Burns poetry on October 31, 2009 by Todd. where my family on my dad’s side originated in the 11th century. love of rolling hills and crumbling stone walls? Maybe even the red hair. ancient barn, near Aberfeldy, in Fortingall. 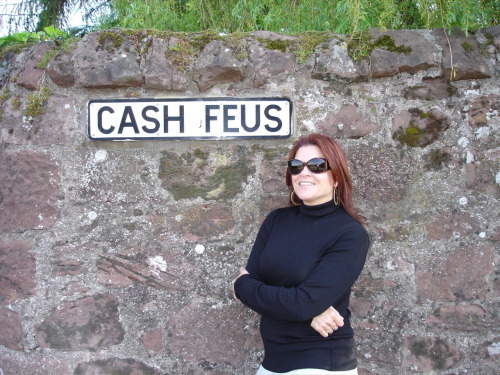 still memorialized every year in Scotland. perhaps the most important thing I have received as a legacy. This entry was posted in Main Page, Music, Robbie Burns Day, Robert Burns & Burns poetry, Scottish, Gaelic, Irish Celtic events and stories on October 28, 2009 by Todd. 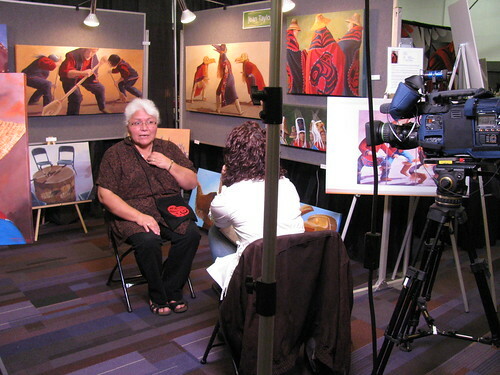 Over 50 artists were featured at the Vancouver 2010 Aboriginal Art Exhibition at Canada Place in Vancouver BC, Oct 17/18. It's a two day free exhibition with sales to the public. On Friday evening, a live auction of highlighted artworks was held with proceeds going towards the Vancouver 2010 Aboriginal Youth Legacy Fund. O Siyam: Aboriginal Art Inspired by the 2010 Olympic and Paralympic Winter Games, which will be available in stores on November 2 — the first official Games-related book to be published. Pre-ordered copies of the book can be made at the exhibition. Alano Edzerza (right) is an amazing young artist that I met. Melissa (left) is his friend who helps him plan events. Melissa is wearing a shirt that Alano designed, for her marathon running competitions. Behind them is a 3-panel design of flying ravens. I really liked it's three dimensionality, and repeated motif. It stands out to many of the flat 2-dimensional designs I have seen in aboriginal art. Alano also designed a 3-panel work featuring killer whales, which inspired a commission from GM place of killer whales. Born in 1981, this 28 year old artist has both a remarkable maturity, and an extensive collection of works and his own gallery. 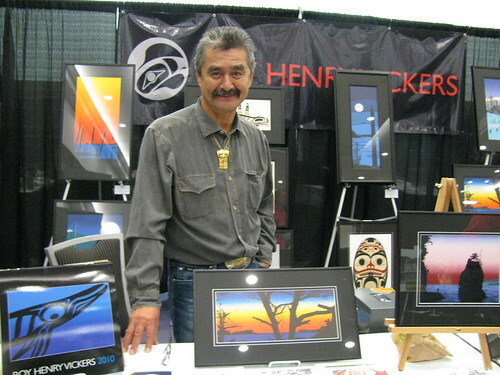 So impressive is Edzerza's work that Roy Henry Vickers was sending people his way at the exhibition. Councillor Lois Joseph of the Lil'Wat Nation Mount Currie Band is very proud of Aboriginal Cultural Centre and Museum, recently build in Whistler BC. 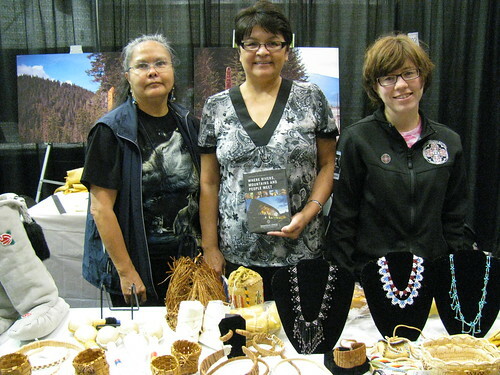 She said it is a collaboration by two nations, Squamish and Lilwat, and it is designed to showcase the history, culture and artworks of the Lil'Wat and Squamish peoples who have been a big part of the Sea to Sky country. I have visited Aboriginal Cultural Centres in Alert Bay, the Haida Gwaii Museum, and even the Polynesian Cultural Centre in Hawaii. I will definitely go visit on my next trip to Whistler. When I told him about Gung Haggis Fat Choy, and how the give recognition to BC's pioneer cultures the Scottish, Chinese and First Nations instead of Canada's two solitudes of French and English… he shared with me that his mother was English. I thanked him for sharing his wisdom and helping make our society a better place. KC Adams is from Winnipeg, but she doesn't identify herself as Metis, because she is part Scottish – not French-Canadian. She is tuned into the growing Mixed-Race culture of Canada, but doesn't call herself a hybrid or mixed-race. Instead she calls herself a cyborg, reflecting our new technology culture for the 21st Century. mixed race classifications by using humorous text and imagery from two cultures. post-gender world free of traditional western stereotypes towards race and gender. KC laughed when I told her about Gung Haggis Fat Choy – but she got it. Juxtoposing cultural images and language in ways that reflect a new understanding – that's what we both do. We recognize Mixed-Race heritage. She was intrigued when I told her that there were people in Madagasca called Metis, but were of Chinese and Madagascar heritage, in this former French colony. But Metis means half, just like the Hawaiian term Hapa. Her artwork captures the spirit and minuitae of aboriginal cultural life. There are scenes of dancing, farming, running with sled dogs. It's beautiful, reflective and wonderfully presented. This entry was posted in Canadian Identity, Canadian Identity & Heritage, Cultural Fusion, Hapa culture, Main Page, Multicultural events, Visual Art and related events on October 18, 2009 by Todd. CUPE's WriterFest Oct 22 featuring host Daniel Gawthrop + Larrisa Lai, Stan Persky, David Chariandy + more! 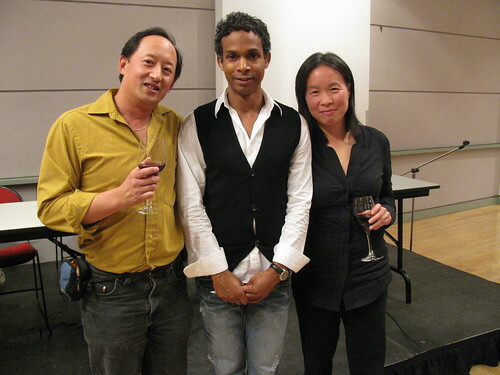 Todd Wong, CUPE 391 Vancouver Library Worker with authors David Chariandy and Larissa Lai. Please join for a discussion on the importance of locally-purchased materials and collection development. With cuts to libraries, arts and recently to BC BookWorld, ABPBC and BCAMP – this is timely! This entry was posted in Literary Events, Main Page, Multicultural events on October 16, 2009 by Todd. 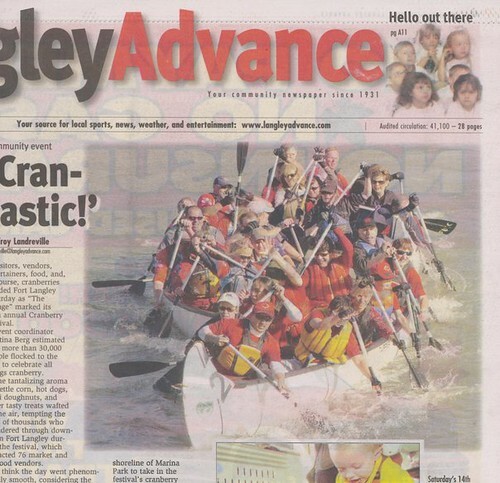 Gung Haggis paddlers featured in cover photo of Langley Advance for Cranberry Festival! Cranberry Festival is a big fun and important event in Ft. Langley. Every year the Gung Haggis Fat Choy dragon boat team attends. In the above picture our Gung Haggis Hot Chili team is caught in a boat jam, as a team pushes our stern forward, preventing us from turn the boat to go left. I am in the front seat, trying to steer our boat left. Our left side paddlers are paddling at a 45 degree angle to help pull our boat left. Our right side paddlers are paddling hard to get us away from the boat colliding on our right side. This is what happens when 3 teams enter a wide turn all at the same time. We got the inside edge going into the turn, and pulled away from the boat beside us… but they kept their bow against our stern, preventing us from turning… meanwhile a third boat caught up on the outside and tried to paddle around us… but got stuck in the middle. It sure looks like fun from this angle. 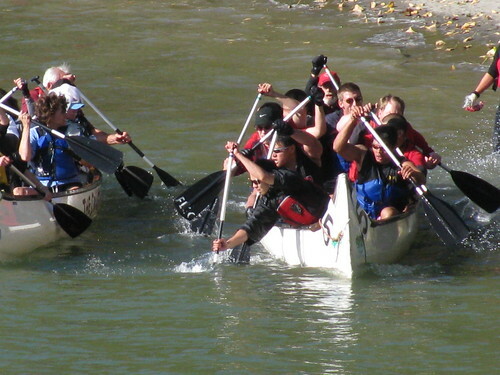 This entry was posted in Dragon Boat Information, Dragon Boat photos 2003, Dragon boat with Todd Wong - Dragon Boat Coach, Gung Haggis dragon boat team information, Main Page on October 16, 2009 by Todd. AMAZING paddling Stories from today's races. Missed Opportunities and lots of boat collisions. Chili teams proved their competitiveness, team spirit and sportsmanship. could join us for Ft. Langley races. Good start… and we were 2nd going down the first stretch. We caught up to the team on the 1st turn… taking the inside edge. and catching up… We placed 3rd. why is Tzhe drawing on the right side, when they are turning left? niece. We have enough cheerleaders to fill a boat. while 2 paddlers remain helping to bail the capsized boat. hypo-thermia, but she is later reported to be okay. At 1:30 16 teams remain to paddle. 4 teams have quit, gone home or to the beer garden. We go over the tactics needed to do good turns, and a good beach run. both missed pumpkins in the A final. sure they grab the pumpkins (avoiding last year's fate)! collision. BacEx corrected and led the way to the closest pumpkin. Marciel grabbed the pumpkin, but lost his paddle at the same moment. buoy. They were in 5th place by the time they made their turn. Raphael jumped out of the beach and held out his paddle for the juice. towards the finish line going under the bridge. Collision as they emerged under the bridge. Oops, BacEx veers left. finishes 4th or 5th in A Final for our highest ever finish in A Final. even planning for next year already. What an exciting day – We never get wind like that in Fort Langley. help. Better safe than sorry. next year please email me. 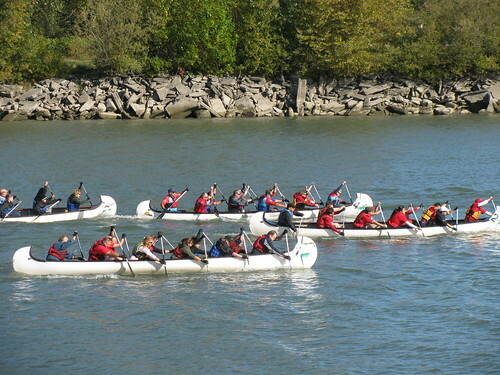 This entry was posted in Dragon Boat Information, Dragon Boat photos 2003, Dragon boat with Todd Wong - Dragon Boat Coach, Gung Haggis dragon boat team information, Main Page, Travel reports, Vancouver Area Adventures on October 11, 2009 by Todd. Orchid Ensemble creates East meets Middle East featuring Jewish and Chinese music! Orchid Ensemble is one of Vancouver's bravest culturally exploring musical ensembles. jazz, blues and classical sounds. Ten Thousand Miles to Kai-Feng. regular with the Vancouver Symphony. the composer behind B.C.’s well-known Jewish music ensemble, Tzimmes. 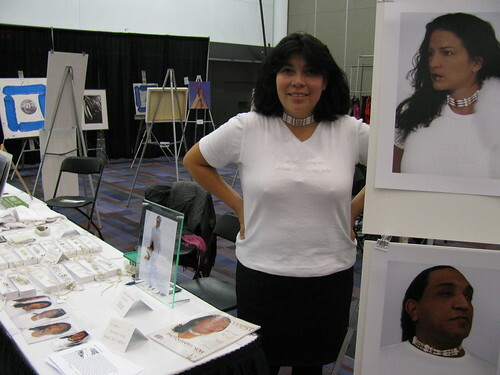 This entry was posted in Asian Canadian Cultural Events, Cultural Fusion, Main Page, Multicultural events, Music, Upcoming Events on October 3, 2009 by Todd.